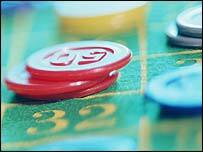 Plans to liberalise Britain's laws on gambling have been defended by Culture Secretary Tessa Jowell. There was a "whiff of snobbery" in some of the opposition to the proposals which would relax restrictions on casinos, she told the Sunday Telegraph. Opponents fear the controversial changes could fuel an explosion in gambling addiction in the UK. Ms Jowell insisted the reforms would create 80,000 jobs and attract investment worth up to £5bn. The proposals include the relaxation of rules on the construction of casinos and sweeping away player restrictions. Players would no longer have to join casinos 24 hours before gambling and would be allowed to drink alcohol at the gaming table. New rules on fruit machine prizes could also result in million-pound jackpots being offered. Ms Jowell said the plans would give ordinary people the opportunity to enjoy pastimes currently reserved for the rich. She told the Sunday Telegraph: "There's a whiff of snobbery in some of the opposition to new casinos. "People who think they should remain the preserve of the rich; others that find them gaudy and in poor taste; others that don't want the big investment that will come from the United States. "They are entitled to those views, but they are not entitled to force them on others." Some newspapers, opposition MPs and prominent members of the Labour Party, including former deputy leader Lord Hattersley have furiously criticised the plans. The Salvation Army feared the plans could lead to problems for gambling addicts. "There are only two real winners that will benefit from the liberalisation of gambling laws: the gaming industry through massively increased profits, and the government through increased taxation," a spokesman said. "The big losers will be the vulnerable people whose lives are ruined by gambling addiction." Shadow culture secretary John Whittingdale said: "This is a typical Labour shambles. The government has had four years to get this bill right, yet now we hear it is split down the middle." Meanwhile, The Observer has claimed Ms Jowell may have to water down her Gambling Bill due to opposition from Cabinet colleagues including Chancellor Gordon Brown and Deputy Prime Minister John Prescott. The paper suggested the number of "super-casinos" allowed under the plans may be limited to 20. But a Culture Department spokesman played down suggestions that a rift was generating. It said ministers and civil servants had never envisaged more than 20-40 casinos set up on the back of the reforms. "This is a bill which has had a great deal of consultation across government and the whole of government has bought into this," said the spokesman. US companies including MGM Mirage and Caesar's Palace already have plans to develop a string of large casinos with up to 1,250 slot machines, some offering £1m prizes. The Observer suggested Mr Prescott may also use planning law to prevent the development of casinos in areas he believes to be inappropriate.